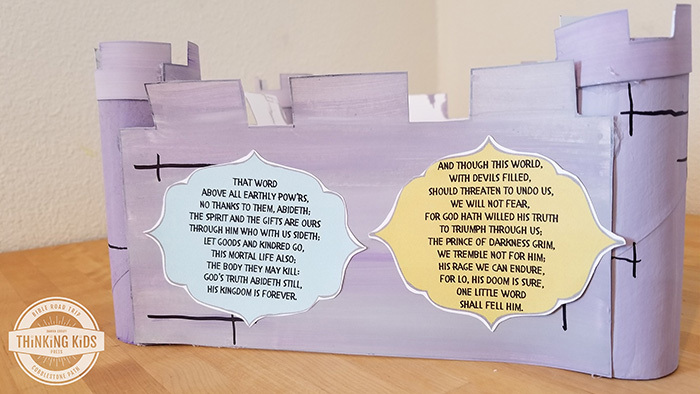 The A Mighty Fortress Is Our God Lyrics Craft will help your children learn about the hymn in a fun way! Martin Luther, the Father of the Reformation, wrote the hymn A Mighty Fortress is Our God while his little town of Wittenberg, Germany was ravaged by the plague. Martin fell ill and recovered before his pregnant wife Katie contracted the disease. Their little girl Elizabeth was born, but died before her first birthday. I think of the pain the Luthers must have suffered, and yet they celebrated the truth that God is our mighty fortress--no matter what we suffer in this life. Before you get started on the craft, read Bible passages that talk about how God is our Fortress, like: 2 Samuel 22:1-3, Psalm 18:1-3, Psalm 31:1-5, and Psalm 91 with your kids. ou could even study castles and talk about why they were built the way they are! You'll receive step-by-step instructions and printable templates and lyrics. You can purchase this craft, or register below to receive a coupon which will make your craft free for household use or 50% off the classroom license. Get started making your A Mighty Fortress is Our God Lyrics Craft today!